Sometimes even the hardest woman has to let her hair down and fall in love. Maybe I did that a little bit tonight, maybe I’m just fooling myself. Either way, this is a good song for falling in love, or at least a glass of wine and some romantic dreaming….. Enjoy ladies, and happy weekend! It’s time to wind-down the weekend with a glass of your favourite spirit and a great song. Pour yourself a glass, turn the lights down low, and click on the link…. A beautiful Sunday evening to you my darlings…. Where to start with this minefield of possible opinions? Likely a bourbon on the rocks and a direct prayer to the universe. My first thought, when I look deeply into my sensitive feminine intuition is, “Why bother?”. My obvious second thought darlings, is, “Why not?”. A recent article in the Style section of the Globe gave a no-brainer instruction sequence to the young lad preparing to wow his girl with a surprise proposal. I cant’ criticize the article, however, being a woman of a certain age, I got a kick out of it. First of all, most marriages at middle-age are either a second marriage (or third, or….). Secondly a surprise proposal at middle-age, as romantic as it may seem, really wouldn’t be that surprising. I mean, come on my cute little rhubarb custard pies, at this stage of the game no one jumps into a life-long commitment without doing their research and talking it into the ground. Nobody with an ounce of common sense anyway. By middle age, we’ve all taken stock of our resources, have kids, or parents with failing health, and quite frankly, enough attitude to take a round out of a biker bar. The Globe article discussed the importance of dressing appropriately. Quite frankly, I hope that by the time I meet a man with enough character to get down on one knee to pop the question that we’re somewhere that fashion doesn’t really matter. Perhaps in bed. Maybe in the backyard reading the paper. At the beach. Out for a walk. I’m assuming I will have the good taste to choose s gentleman who is aware of the no socks with sandals rule. Planning the ceremony? Not such a big deal at middle age. Catered in the backyard. A short beach holiday with our besties. Perhaps at the park under a full moon. The bottom line is, that by the time you’re middle-aged, you likely have the good common sense to have given your relationship the ‘live-in’ test drive it deserves, complete with flannel, flatulence, flu-bugs and sports vs. chick-flicks on the tube. Well adjusted men and women are pretty content with their own company by this stage of the game, so having another person around full-time is testament to their solid character anyways. If a middle-aged (ok, maybe past middle-aged) man has the kahonas to pop the question, who really cares if he’s sporting the latest style, rehearsed in front of a mirror, or exhumed your father’s body to get permission. He’s made an attempt at romance, even after the reality of a prince-not-so-charming has taken root. 1) If she criticizes you for your cutesy efforts take the ring back. Real women appreciate your effort, or at least a good laugh. 2) Size doesn’t matter. 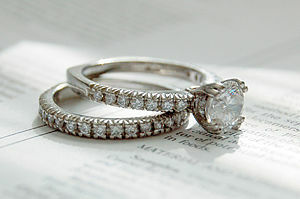 It matters that you know what style of ring she will look at and know you thought of her. 3) Make sure you two are solid, have talked it to death, and are committed before you pop the question. Don’t scare the hell out of her. 4) Keep it to yourself. No jumbotrons, no popping the question in front of a crowd, no telling the world. Tell your best pal if you need to shake off some of the nervous energy, but other than that keep your trap shut. Announce the wonderful news together. 5) Be near a phone. 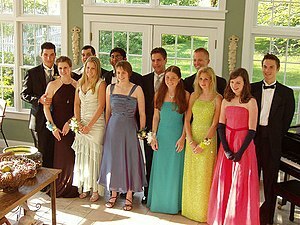 I know that my friends have a running bet that I will never get married again. If it ever happens, I will be on the horn faster than a mustang on a mare. 6) Be scrubbed and ready to go. Women of a certain age have an, um, er…..well, insatiable appetite. Be prepared, that’s all I’m sayin’. 7) Ignore #2. Go big or go home. 8) Do it on a day when she needs to remember how lucky she is. Crappy day at work – voila. Fixed! 9) Don’t tell her what you spent on the ring. Middle aged women don’t want a show piece that’s going to take you a year to pay off, we want you to have the deal sealed and be a gentleman about it. Shh! 10) Smile. You’re about to wander into a lovely part of life with a woman who knows what she wants, and you’re him. Congrats! Ok, maybe I didn’t just learn these things, but they crystalized for me. Whether it was during my morning read of the Globe and Mail, a chat with a friend, or quiet time reflecting on life in general with a glass of wine and a favourite soundtrack playing in the background, I realized that I must share these nuggets of wisdom with you, my sassy readers. 2) You cannot have it all. You can be excellent at only one thing at a time. I just so happen to be an excellent mom, business woman and writer at different times during the day. 3) Good things do not come to those who wait. Good things come to those who consistently work hard and don’t let failure or rejection get them down. 4) Being the perfect size, saying the perfect things, doing things in a conventional way are not priorities of mine, and I have an awesome life because of that. Go ahead, Zen-out. 5) Wine and fudge do go together. 6) Clutter makes me crazy. 7) It really doesn’t matter what anyone else thinks. 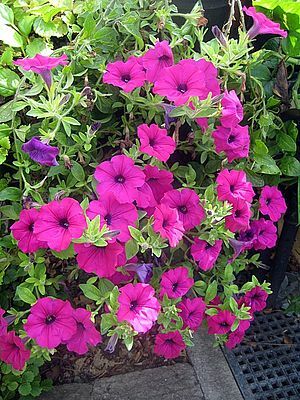 Now, I’m not going to work in my writing duds with a glass of cheap hooch clutched in my hands my pretty petunias, but slight imperfections really just don’t matter when you’re being authentic. 8) We all procrastinate when it comes to the really, really important stuff. 9) You can spend too much time alone, and it’s always nice to have friends drop by for a visit and a glass of wine, mug of coffee, cup of tea, walk around the lake, chick flick or general chin wag. 10) Freedom from fear creates success. There’s nothing like a leisurely BBQ during a long weekend. At our house, we have one every day of the long weekend. I prepare a nice bowl of couscous salad, a pasta salad with sun-dried tomatoes and black olives, and uncork a lovely bottle of wine. I suggest Strut Cab Couture – a delicious, chewy wine that makes you smile, ease into your muskoka chair and offer up a prayer of gratitude to the universe. Thanks to my friend Darlene for introducing us! This combination is a simple, easy, way to relax with delicious food and wonderful company. 1) Thoroughly ix all ingredients together using your hands. 3) Place directly on pre-heated BBQ grill, and cook as desired. I grew up on the lake. We had beaches, freedom, youth and fearlessness on our side. The Victoria Day weekend was the first real celebration of Canadian summer, and it was aptly nicknamed May “Two-Four” for the numerous cases of beer that were consumed. Everyone needed at least one ‘Two-Four’ for the weekend. In my tiny little Canadian town, the firemen held a pancake breakfast, and the Provincial park was full of the first wave of campers that would take over for the hot, summer months. Fishermen came in droves, and the locals let it all hang out, with partying as their top priority. It was a ritual celebration to welcome summer. And then there were the adults. The gardeners. As a rule of thumb in my neck of the woods, you didn’t plant anything until the May ‘Two-Four’ weekend, as that was the magic date that made the risk of frost a mere pip-squeak on the list of natural threats. Although life has changed and I’m a city girl in every way possible, I still like having my own small patch of dirt to call my own. I have a guerrilla-garden in the city, and this May ‘Two-Four’, I’m looking forward to getting some earth under my nails. I hear the basil, mint, cilantro, tomatoes, eggplant and zucchini calling to me. My petunias are waving at me from their little plastic shell packs to let them out. Ah yes, the May ‘Two-Four’ weekend, the ceremonial ribbon-cutting for gardeners across the country is upon us. Rest assured, I will also be indulging in the Canadian tradition of cold brewskies as well darlings. After all, when you’re this fabulous you must celebrate daily. Happy first-long-weekend-of-the-summer my friends. Enjoy!